which shows 126 aerial views over the whole region of Canton Ticino, southern Switzerland. 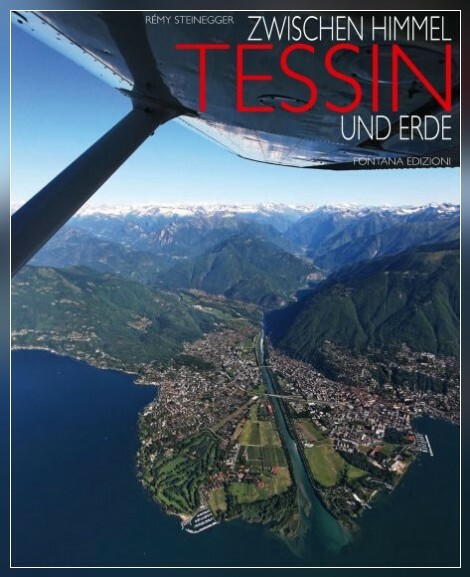 This coffee-table book shows 126 aerial views capturing the whole region of Canton Ticino, southern Switzerland, most of them printed on double pages. The text is in Italian and German. The book jacket can be chosen as an Italian or German version. Twelve years ago my Editor Raoul Fontana published my first version of a book with aerial views of Ticino which was titled "TICINO dall'alto / TESSIN aus heiterem Himmel" and it became his bestseller and was reprinted several times. My friend and neighbour Ernesto Looser, a professional pilot and instructor working all his professional life for the Swiss Air Forces got retired - and as all real aeronautic enthusiasts, he is not really feeling fine with his two feet posed on earth ... This fact was the basic for new flight experiences for me and we decided to create a totally new verison of the book. The imaginary round trip starts on Ernesto's former home base Locarno-Magadino, leads first over the northern part of Ticino, turns back to Bellinzona, continues flying over the south of the canton and we finally turn back to the departure airport. Combining the photographs of several flights during different seasons we get a colourful and diversified picture story. You can see a selection of 17 big prints (on PET) exposed in the Restaurant of Swissminiatur in Melide. Are you interested to buy my photo posters ? Please send me an e-mail and I will arrange it for you! shipping is NOT included ! Ernesto Looser, my friend and pilot flew me around and helped me to catch wonderful pictures! Barbara Hofmann, my friend and author wrote a sensitive essay to accompany the images! Raoul Fontana, my friend and publisher made it possible to realise a beautiful book! Dominique Vuigner, my friend and owner of Swissminiatur Exhibition had the idea to have an exhibition! Hansjoerg Hasler, my friend and owner of Rutschi Ticino SA realised wonderful prints on PET!